This Boston Terrier occasionally barks at me from a lawn on Judith Drive. I don't see him often; our schedules don't mesh. I don't even know his name. Although his bark is friendly, he can't run over to me for a pat on the head. Like most dogs in our neighborhood, he wears an electronic collar that sounds a warning buzzer when he approaches the Invisible Fence buried in the perimeter of the lawn. Can you see the regret in his eyes? He wants to know me, but the fence won't oblige. 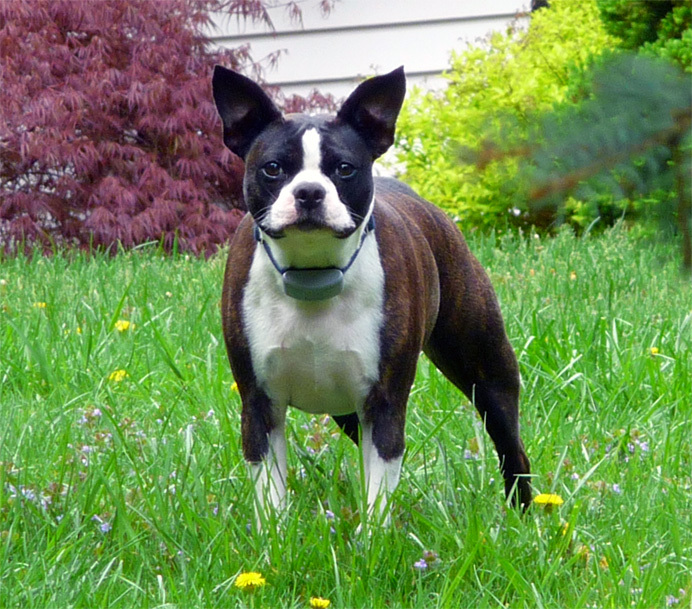 Because its markings resemble formal wear, the Boston Terrier is sometimes called "the American Gentleman." It isn't really a terrier, but a cross (originated by Robert C. Hooper, of Boston) between the English Bulldog and a now-extinct breed of foxhunter called the English White Terrier. The Boston terrier dates only to the 1870s, and is one of just a handful of recognized breeds native to the United States. I never see a Boston Terrier without thinking of Paul’s Barbershop, in Avis, Pennsylvania, where my father took all five of us for 50-cent haircuts. (The going rate was $1. Apparently, we had a bulk deal.) It was a classic three-chair shop with a checker-tile floor and huge leather waiting chairs. It smelled of tonic and cigars. Paul, a kindly chain-smoker whose life and family have forever remained a mystery to me, gave me my first haircut there in 1950. I still remember crying over it. But I also remember his Boston Terriers. He had a whole pack of them—six strong—who lived behind a curtain hung in the back doorway. If you sneaked over there and suddenly whipped open the curtain, six faces with bulging eyes would erupt in a wild cacophony until you closed it again. Paul had trained his dogs never to come into the shop. He made one exception, however. Whenever they heard the whine of the electric shaving-cream dispenser, they would burst through the curtain to lap up any drops of hot lather that spilled on the floor. (I can still hear their toenails clicking on the tile.) We used to beg Paul to demonstrate this. Sometimes he did; sometimes he didn't. But as we climbed down from the chair with our ears newly ventilated and our heads evaporating Wildroot, he always gave us a penny to spend in the gumball machine bolted to the heavy oak table piled with dog-eared issues of Popular Mechanics and Field & Stream.